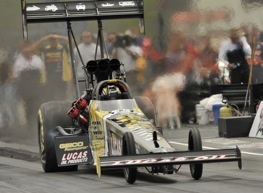 Morgan Lucas collected the Top Fuel victory at Brainerd Sunday. Morgan Lucas and Hector Arana scored huge victories in Top Fuel and Pro Stock Motorcycle at the 28th annual Lucas Oil NHRA Nationals at Brainerd International Raceway in Minnesota. Tony Pedregon (Funny Car) and Greg Anderson (Pro Stock) also scored important and emotional wins. The twin victories by Lucas, whose parents, Forrest and Charlotte, own Lucas Oil Products, and Arana, one of the first racers ever to receive sponsorship from the Lucases, somehow overshadowed the victory drama of Pedregon, who overcome the pre-race departure of his tuning braintrust, and Anderson, who ended one of the longest droughts of his Pro Stock career. With his parents watching intently, Lucas, who lost the first five finals of his Top Fuel career, won his second straight by edging Larry Dixon in a thrilling 3.814 to 3.818 final round.The Top Fuel final paired the top two qualifiers, No. 1 Lucas and No. 2 Dixon, whose performances had mirrored one another throughout the day. Lucas’ Jimmy Walsh-tuned GEICO Powersports dragster sat down Chris Karamesines with a 3.84 in round one then ran matching 3.83s to beat Brandon Bernstein and Cory McClenathan to reach his seventh career Top Fuel final and his 20th overall and, in the process, clinch his berth in the Countdown to 1 playoffs. Lucas, who previously had won this event in Alcohol Dragster in 2004, collected his 12th career win with a career-best run. Two-time Brainerd winner Dixon, who was 4-0 in finals this season, reached the 88th final of his Top Fuel career by powering his Jason McCulloch-tuned Alan Johnson Racing/Al-Anabi dragster past Scott Palmer, Joe Hartley, and points leader Antron Brown with an impressive trio of consistent, low 3.8-second passes: 3.83, 3.84, and 3.83. His semifinal victory over Brown snapped Brown’s 14-round winning streak. A round earlier, Brown had defeated world champ Tony Schumacher by just .004-second, running 318.69 mph, the third fastest speed in the 1,000-foot era. Brown now owns five of the top 10 speeds. On a day filled with upsets, the Funny Car final still not only pitted the top two drivers in points but also a true battle for first place, Pedregon held onto his lead despite competing without crew chief Dickie Venables and assistant crew chief Kurt Elliott, both of whom left the team just before the event. Pedregon, with tuning assistance from teammate Rahn Tobler and newly-hired Tony Shortall, won all four rounds Sunday, capping it with an easy victory when Ron Capps smoked the tires 250 feet into his run. The win is the 43rd of Pedregon’s career and his third this season. Pedregon’s Wicked Quick/Quaker State Chevy came into Sunday from the No. 1 qualifying spot and on the strength of a pair of runner-ups at the schedule’s two most recent events. He opened his raceday account by defeating Jeff Arend with a 4.13, then put a dent in his brother Cruz’s playoff hopes with a straight-up 4.15 to 4.18 conquest. Pedregon earned his seventh final-round appearance of the season (and the 74th of his career) with his driving, slapping a .097 to .126 holeshot on Jack Beckman to score a holeshot win, 4.18 to 4.16. Capps’ Ed McCulloch-tuned NAPA Auto Parts Dodge barely escaped the first round, where he defeated red-hot Tim Wilkerson, winner of the tour’s last two events, by just .006-second. After beating Bob Tasca’s Quick Lane Ford with a 4.16 in the second round, Capps outdueled perennial Brainerd winner John Force in a pedalfest, 5.25 to 5.85, to reach the 59th career Funny Car final of his career and his seventh of the season. The Pro Stock final featured a rematch from the series’ most recent event in Sonoma, Calif., as Summit Racing teammates Anderson and Jason Line – both homegrown Minnesotans — faced off again, but Anderson was able to reverse the outcome edging Line by just .002-second, 6.64 to 6.65. The victory was Anderson’s second at this event and the 58th of his career. Anderson, winless since last year’s World Finals, reached his 85th career Pro Stock final by erasing Lucas-backed Larry Morgan in round one with a 6.69, then defeated points leader Jeg Coughlin in the second round with a quicker-still 6.65. He reached the final, his third of the season, with a holeshot victory over the No. 2 qualifier, Allen Johnson, 6.66 to 6.65. Line, who scored his first career NHRA victories here in Stock in 1992 and ’97, made it back to the final round with his fifth straight Pro Stock final of the season and his eighth overall this year. Line opened his Sunday action against another former Minnesotan, defeating defending event champ Kurt Johnson with a 6.68, then edged Ron Krisher with a 6.67. Line showcased his improved driving skills by reaching the final, the 42nd of his Pro Stock career, on a holeshot victory over No. 1 qualifier Mike Edwards, 6.65 to 6.63. Edwards’ losing time and his speed, 208.07, were both meet bests but came in a losing cause. Arana went wire to wire in Pro Stock Motorcycle with his Lucas Oil Buell, capping his day with an easy pass when upstart Junior Pippin fouled in the final round. The victory is Arana’s second this season and the third of his long career and pushed him all the way to fourth place in the standings and, as a bonus, including clinching his spot in the Countdown to 1 playoffs. Arana came into Sunday’s eliminations confident after qualifying No. 1 with a 7.04 at his sponsor’s race and looked like a world-beater all day, beginning with a stunning tenth-better 6.94 pasting of Wesley Wells then hammered out a 6.95 against rookie phenom Doug Horne. Arana, winner earlier this season in Gainesville, reached his second final of the season and the fifth of his career with a solid 6.96 to defeat reigning world champ Eddie Krawiec and end the Harley rider’s impressive streak of consecutive final-round appearances at seven. Pippin, all but overlooked in his slim chance of clawing his way into the top 10 and earning a berth in the Countdown to 1 playoffs, helpe dhis cause with his runner-up showing. Pippin had never won a round of racing in his two seasons on the NHRA Full Throttle Drag Racing Series aboard his PiranahZ/Stone Mountain Buell, but got his first on this day on a 7.05 to 7.03 holeshot win over former world champ Andrew Hines, then kept the ball rolling with victories over red-lighting Shawn Gann and Craig Treble with passes of 7.07 and 7.04. The event was the 16th of 24 events on the 2009 NHRA Full Throttle Drag Racing Series schedule and the third to last in the regular season that will set the top 10 combatants in each class for this fall’s six-race championship battles.